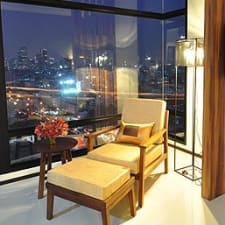 Located in Silom / Sathorn, Plus Grand Howard is a perfect starting point from which to explore Bangkok. The hotel offers a high standard of service and amenities to suit the individual needs of all travelers. Laundry service/dry cleaning, car park, restaurant, airport transfer, Wi-Fi in public areas are on the list of things guests can enjoy. Relax in your comfortable guestroom, featuring desk, television, separate shower and tub, satellite/cable TV, bathtub. Access to the hotel's garden, indoor pool, fitness center will further enhance your satisfying stay. Convenience and comfort makes Plus Grand Howard the perfect choice for your stay in Bangkok.